power units, that’s 200 kWh/d per person. used by driving an average fossil-fuel car 50 km per day. entire fleet of all wind turbines in the world. wind farms must cover a very large area. (2 W/m2), against a real UK wind farm. turbines with a combined peak capacity of 322 MW in an area of 55 km2. on the site; a typical factor for a good site with modern turbines is 30%. Figure 4.3. 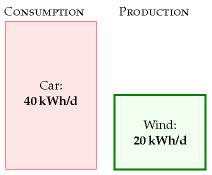 Chapter 4’s conclusion: the maximum plausible production from on-shore windmills in the United Kingdom is 20 kWh per day per person. Table 4.4. Facts worth remembering: wind farms. Table 4.5. Facts worth remembering: population density. See page 338 for more population densities.